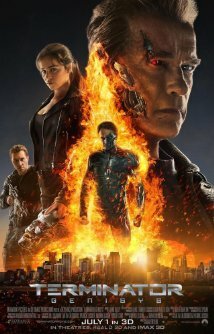 Terminator Genisys directed by Alan Taylor and starring Arnold Schwarznegger and Emilia Clarke tells the story of Kyle Reese as he is sent back in time to the year 1984 to save John Conner’s mother Sarah Conner from the ultimate Terminator. This movie answers a lot of questions about the series and gives movie goers a lot of insight on how the world really is in the future of John Connor’s life. We are taken on an adventure that really opens our eyes to the consequences of “we” as humans having too much technology and being able to only depend upon that technology to survive everyday life. The story runs deeper than the I-robot story, and more than touches the surface of those deep unanswered questions that the new AMC show “Humans” has to introduce. This movie has a lot going on and I’m not going to get into too many details here, but I must say that I thought it was very well done, and that the storyline was well written. To my surprise the theater wasn’t sold out and this film did not do as well as it deserved to. I think that it’s been too many years since the series started and I felt that only people in my generation really had the chance to appreciate it. If this was done maybe ten years earlier then I believe that it would had done better at the box office. Arnold Schwarznegger did a great job with his performance, he gave only what classic Arnold could give. The movie paid homage to the original film but also honored and embraced the Arnold of today. It was great to see Emilia Clarke in a strong female lead, something different from the fragile dragon princess in Game of Thrones. The idea of the hero ending up becoming the ultimate villain was unexpected and thrilling. The special effects, makeup and sound all presented a fluidity of consistency that created a tone that was appropriate for a 2015 Sci-Fi action film. I gave Terminator Genisys four stars out of five and recommend it to any Sci-Fi fan. See the others first, because once you do, the entire story will flow better.